Peanut and Jaggery Laddu are vegan, gluten-free and with no added fat. The laddus are melt in the mouth, delicious and addictive and make a healthy snack. Peanuts or groundnuts are the staple snacks in winters in north India. Nuts with shells are roasted in the sand in a large iron wok on clay angithi (oven) and sold in the carts. The vendors also sell the sweets like chikki, made with peanuts and jaggery. Our ancient food theories have a profound understanding of the food and diet according to the seasons. It came with the understanding the fact that changes in diet also need to be altered by the changing seasons. Most of the festivals in India celebrate and welcome new seasons and have specific food assigned to each of them. This is really apt and very interesting. In summers, the weather is extremely hot. The body needs simple and easily digestible foods and foods that are coolants. Similarly, during winters the weather is cold and dry and body requires foods that are nutrient rich and body warming and rich in natural oils. In North India, we get fresh produce of groundnuts. Winter is also the time when fresh Jaggery is made in our villages in the foothills. Our traditional sweets during winters are made with groundnuts and jaggery. 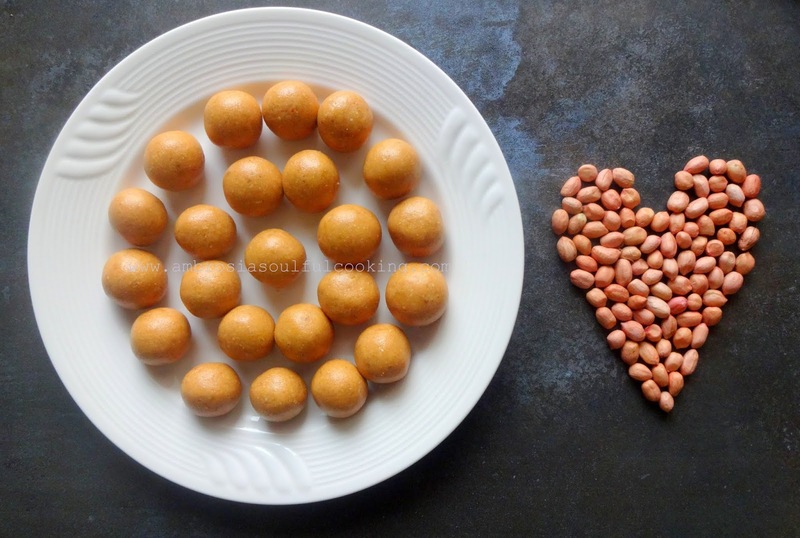 On Makar Sankranti and Lohri, most of the sweets are prepared using Peanuts and Jaggery. Peanuts are good for the heart. Peanuts are rich in proteins and folic acid. 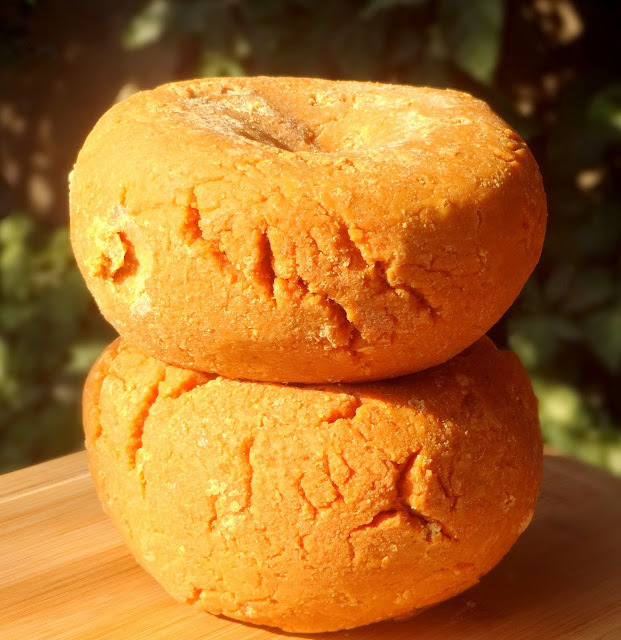 Jaggery is rich in calcium and iron. It removes toxic matter from the body and keeps the body warm. It is a great immunity booster and blood purifier. It is a natural cleanser that efficiently cleans the respiratory tract, lungs, and food pipe and stomach. Peanuts and jaggery make a healthy combination. 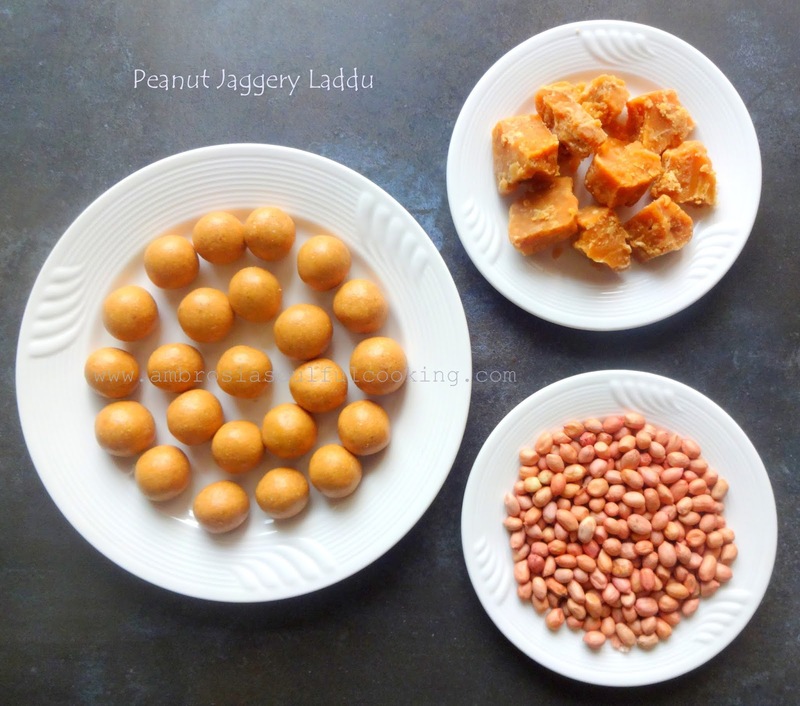 Peanut Jaggery laddu are made every winter in our home several times. The laddus come together quickly and easily and make a healthy snack. The melt in the mouth laddu have no added fat and are delicious and addictive. Roast peanuts on low flame until they crackle and turn golden. Or, take peanuts in a baking tray. Preheat oven to 150 degrees. Set timer to 15 minutes. Toast the peanuts until they begin to crackle and turn golden. Remove the skin from the roasted nuts. Grind the warm nuts until you get a fine powder and the nuts begin to turn buttery. Buttery nuts help in binding the laddus well. Add crumbled jaggery to the mixture. Pulse twice or thrice in the grinder. Transfer the mixture to a plate. Add powdered cardamom. Mix well. Take a handful of mixture and shape into ball pressing the mixture tightly with your fingers. Use only one hand to shape laddu. In case if the mixture seems a bit dry, add more jaggery. Note: Make these laddus with the jaggery that comes in blocks. 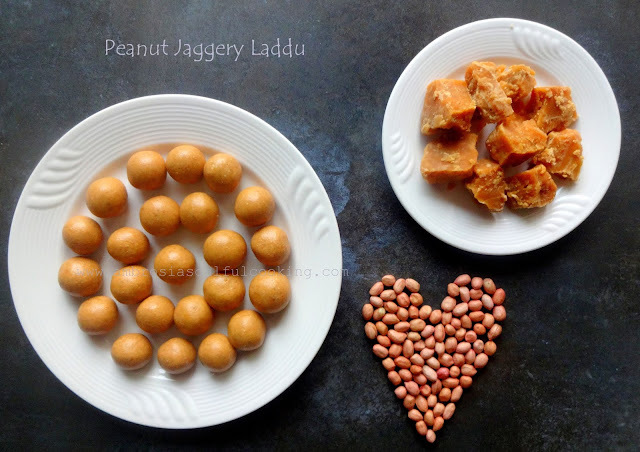 This jaggery is soft and turns mushy and binds the laddu well. Store bought jaggery powder or small chunks will not bind the laddus well.